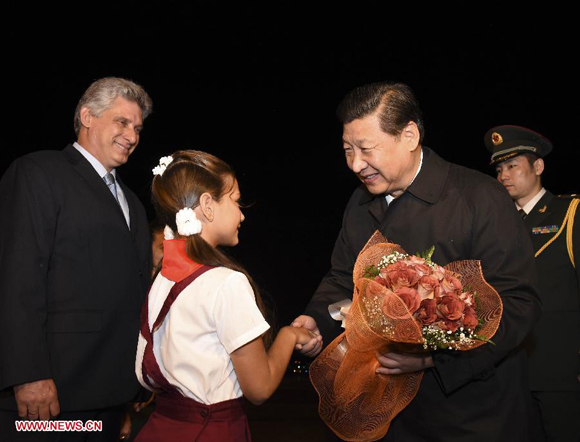 Chinese President Xi Jinping arrived in Cuba Monday for his first state visit to Cuba since taking office. In Cuba, Xi will hold talks with Cuban leader Raul Castro to draw up a blueprint for the future development of China-Cuba relations at a strategic height and from a long-term perspective. The two sides will also sign documents of cooperation covering economy, trade, agriculture, bio-technology, culture and education. In written remarks released upon arrival, Xi recalled that back in 1960, Cuba became the first Latin American and Caribbean nation to forge diplomatic relations with New China, opening a new chapter for China-Latin America ties. Since then the two nations have withstood the tests of a constantly changing international landscape, he said, adding that the two good friends, comrades and brothers have contributed a lot to promoting solidarity and cooperation among developing countries and safeguarding their common interests. "I look forward to having in-depth talks with President Raul Castro and other Cuban leaders over bilateral relations and issues of common concern, taking stock of experience in growing the bilateral relationship and charting the course for its future development," said the Chinese leader. Cuba, an important Latin American and Caribbean nation, has adhered to the socialist course for more than 50 years under the leadership of the Communist Party of Cuba, Xi noted. The country has also firmly safeguarded national sovereignty, worked hard to promote economic growth, and constantly improved people's livelihood, thus making outstanding achievements in various fields of social and economic development, he said. "We would like to extend our congratulations to Cuba and sincerely hope that Cuba can achieve one victory after another in socialist construction," said Xi. With both nations now in a critical juncture for development, they face new important opportunities to grow their relations, he said. The Chinese president hoped that with joint efforts from both sides, his visit will achieve the goal of promoting friendship, deepening mutual trust, expanding cooperation and boosting development, and usher in a new era for the bilateral mutually-beneficial cooperation and friendship. Cuba is the last leg of Xi's four-nation Latin America tour, which has already taken him to Brazil, Argentina and Venezuela. He also attended the sixth BRICS summit and met leaders of Latin American and Caribbean nations in Brazil. Chinese President Xi Jinping arrived in Havana Monday for his first state visit to Cuba since taking office and he will hold talks with Cuban leader paul Castro.